From Twinings of London, I have with me the Lady Grey Tea. I bought this because the name sounded special. 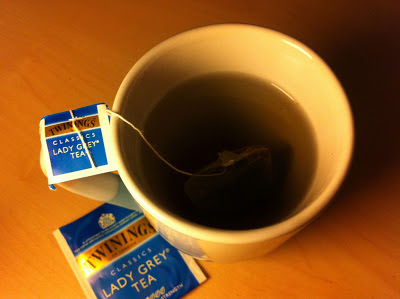 Never having heard of it before, it was suggested to me that it could be Lady Gaga's version of Earl Grey. I now know that it's a variation of Earl Grey. From wikipedia entry: "Like Earl Grey it is a black tea scented with oil of bergamot (though in lower concentrations in lady grey), additionally it contains lemon peel and orange peel oil... created by Twinings in the early 1990s to appeal to the Nordic market, who found Earl Grey tea too pungent"
The name, Lady Grey, is a registered trademark. So if you want to drink this, you have to buy from Twinings. Oh well, I have to taste it to find out. The box is printed in blue and it marketed under the Classics category. Twinings do have "modern" funky flavours which I will review next time. Stated on the box, the tea has light flavour strength, giving it two out of five tea leaves in Twinings-speak. There are 25 sachets in this box, all lined up nicely. Taking a whiff of the sachets, I can only make out the smell of black tea. Perhaps the flavours can only be tasted and not smelled. After making a hot cup of Lady Grey and letting the tea infuse for 5 minutes, a clear and light earthly colour has formed. The scent is light and smells somewhat fruity. Taking a sip, I can taste the citrus flavours indeed. The orange and lemon flavour stands out more than the bergamot. If I have to put a number to the composition: 50% orange, 40% lemon, 10% bergamot. The tea goes down easy and leaves your mouth feeling light minty fresh with a slight aftertaste of orange. At $6.15 for 25 sachets (2g), the Twinings Lady Grey tea is fairly priced. 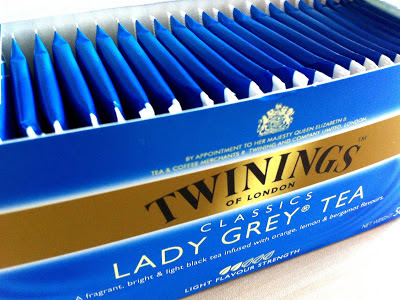 If you are looking for something similar to Earl Grey, I will say that the Lady Grey does not have strong resemblance. It is an interesting composition of flavours that will suit anybody, not just a lady.